The Holes In Swiss Cheese Are Caused By? The first recorded instance of any kind of vending machine apparatus comes to us courtesy of Hero of Alexandria, a first century mathematician and engineer. In his writings, he described and sketched out a clever but mechanically simple device designed to stop people from taking holy water without making a payment to the church. 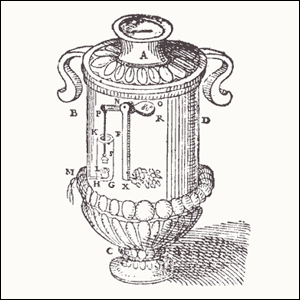 The device was simply an urn with a hidden mechanism inside so that coins dropped through a slot in the top would push down a lever which would in turn open a valve allowing the holy water to flow out. Despite the practical nature of his invention, vending machines didn’t rise in popularity by any measure until the advent of the industrial revolution when both mass produced goods in need of a distribution channel and mass produced parts (like sensitive actuator arms to check the weight of coins) made it possible to produce vending machines on a large scale. The earliest modern vending machines, introduced in the 1880s, dispensed postcards and later chewing gum and candies.